I recently received a request for a good lemon bar recipe – this one is a balanced blend of tart and sweet, and is easy to make. I recently brought these to a world cup match (Ghana vs. USA, for the curious) and they were a hit! 1. Preheat oven to 350 degrees. Grease a 9.5×13” baking pan. 2. Combine the flour, the 1 & 1/3 cup confectioners’ sugar, and butter to make the bottom crust. 3. Pat dough into prepared pan. I feel that those extra chunks of butter on top give the crust a shortcake-like texture. Either that, or I just love butter. 4. Bake for 15 minutes, or until the crust is light gold. I don’t have a juicer, so I made do with a fork. 6 large lemons yielded about 1 cup of juice. Remember to remove those pesky little seeds. 6. Combine eggs, sugar, 6 tbsp flour and the lemon juice until frothy and there are no lumps. Lumps = uncooked flour. Me no likey. 7. Pour the lemon/egg mixture onto the baked crust and pop it into the oven for 25 minutes or light golden. Different ovens cook differently – make sure not to brown your lemon bars! Keep an eye on those suckers. 8. Once it is completely cooled, dust with 1/4 cup confectioners sugar and cut into squares. Completely cooled, mmkay? If you try this step while the pan is still hot, you’ll get some hot c-sugar mess. Dunzo! Lemon bars! Give it a try, and let me know how it goes. What’s your favorite bar to eat? Bake? 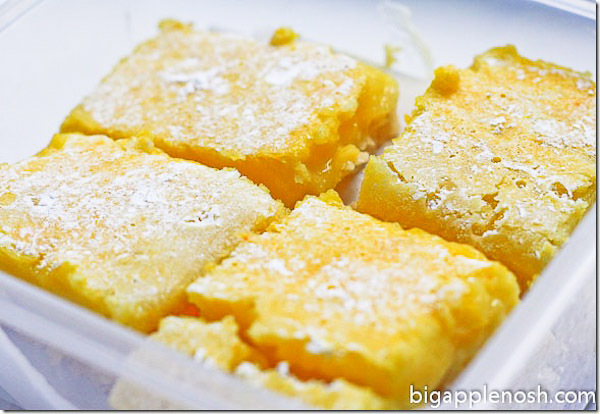 OMG, I love lemon bars and this seems relatively simple…I am feeling inspired to try it tomorrow! oh yum! i can just taste the zingy sweet tang! gosh i love your picture recipes. Thanks for posting so quickly! @Runrgurl10 Let me know how it goes! MMMMMMMMMMMMMMMMMMMMMM!!!!!!!!! Citrus desserts are to die for. The hot bar at Whole Foods is AMAZING! Definitely something I look forward to and then splurge on it.Thank you for another tabata workout video. I’m loving them!